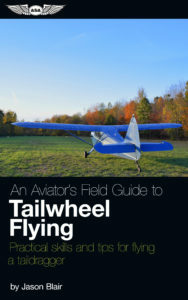 Weather is a major factor in the ability for pilots to safely and successfully conduct flights. It is the same for pilots seeking training. We all know that cancelling training flights slows down training, can result in increased training costs, and if nothing else, can just be really frustrating for a pilot working to get a rating or certificate completed. Without a doubt, some places naturally have better weather than others. I have had many people ask me over the years where they should go to get training and I didn’t really have an answer for them when they further queried about where the weather was best for flight training. 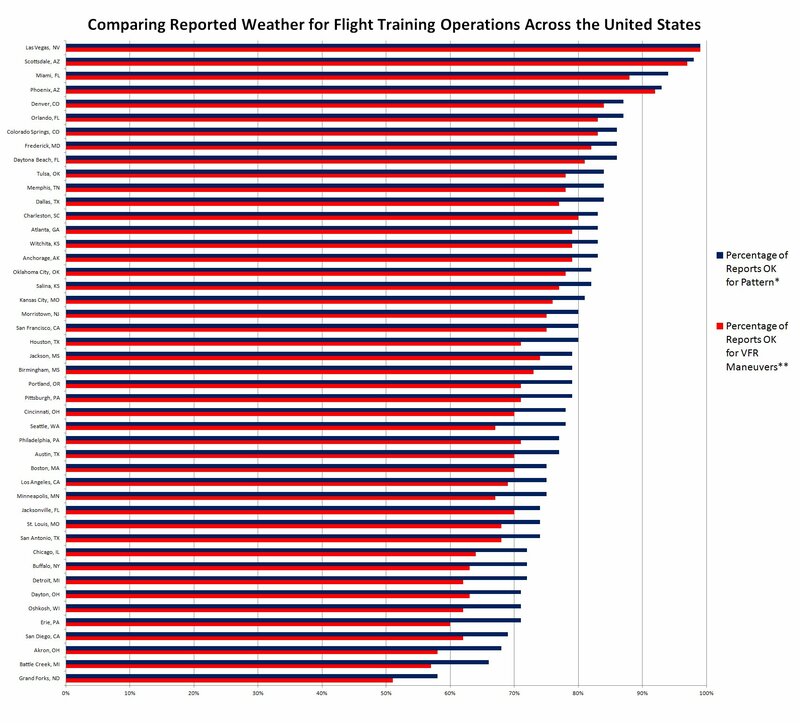 So I got curious, where should a pilot go to minimize the effect of weather on their training schedule? 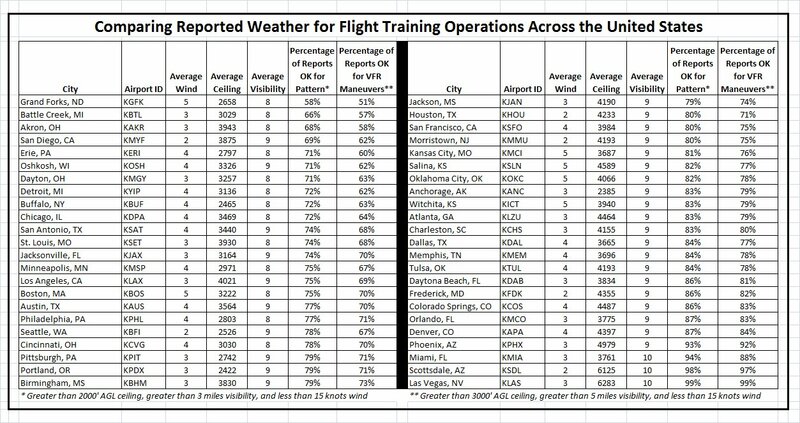 The aviation dork in me just knew there was a way I could break this down to a spreadsheet and math to get a solid answer on which I could hang my hat for recommending where the best training weather exists. Fortunately, the NOAA (the National Oceanic and Atmospheric Administration) at their NCDC (National Climatic Data Center) which is a part of the NESDIS (National Environmental Satellite, Data and Information Service) [are you tired or acronyms yet?] compiles all the weather reports we commonly refer to as METARs in aviation and archives them. You can find access to this at http://www7.ncdc.noaa.gov/CDO/cdopoemain.cmd?datasetabbv=DS3505&countryabbv=&georegionabbv=&resolution=40 if you want, but I already did the hard part for you , I compared the data that is available for a period of time. 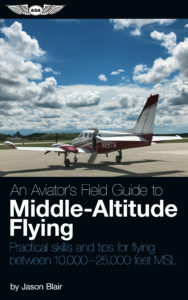 To compare the weather, I selected 44 locations around the country that either represented major regions, were larger metropolitan areas, or were places I knew that there were high densities of flight training and people would want to know about. Sorry if your home airport wasn’t selected, but I had to cut off the data compiling somewhere before my eyes crossed and my spreadsheet program got overwhelmed. Oh, I also made sure to pick places for which a reliable period of time for reports was available that compared with other locations. 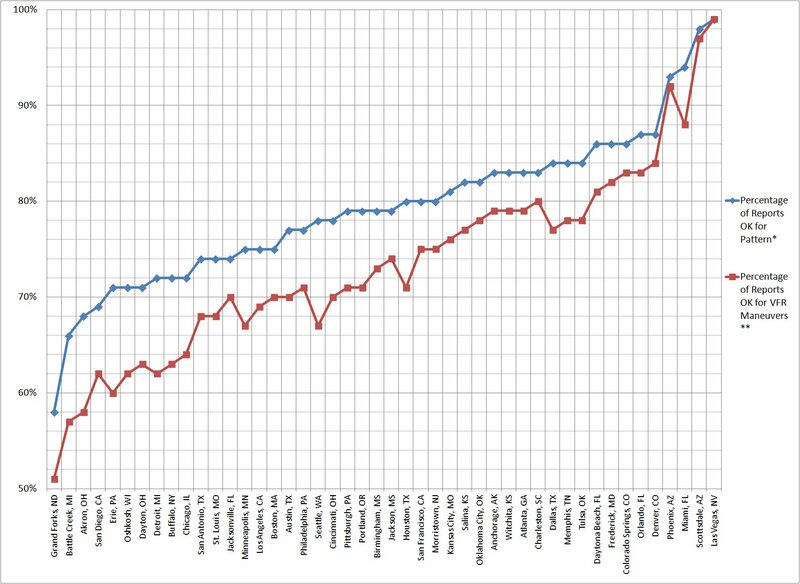 In this case, I compared every METAR report that had a full report (winds, ceiling, visibility, etc) from January 1, 2010 through December 31, 2014. A full 5 years of METARS for each location. Ok, I promise, only one more brief note about what I did, then we can have the results. I assumed that to be good enough weather to fly a traffic pattern for training, you would want at least 3 miles visibility, a 2000’ agl ceiling, and less than 15 knots of wind. This gets basic pattern work done. For more maneuvers, such as things you would do in a practice area, I set a limitation of more than 5 miles visibility, a 3000’ ceiling, and less than 15 knots. And now for the results. Drumroll please. The chart shows what we found. There really is a difference in locations for training weather. Choosing the best versus the worst could result in a difference of nearly one third of scheduled lessons being cancelled. Where I live (and conduct checkrides), it feels like we lose a large number of days to weather causing reschedules or just cancellations of flights. The math proves this out. In Battle Creek, MI, we lose roughly one third of the reporting periods for pattern work and 42% of reporting periods for flying maneuvers. That means that if you were considering the reported weather, you would lose nearly half of the days for maneuvers and a third for just flying a traffic pattern. That is pretty shocking to me! Battle Creek wasn’t the worst of the places I compared. Grand Forks, ND was even slightly worse. Interestingly enough, Battle Creek and Grand Forks happen to be the home airports for two of the largest collegiate aviation programs (Western Michigan University and the University of North Dakota respectively) in the country. It really came as no surprise that places like Las Vegas, Scottsdale, Phoenix, and Miami topped the charts for good weather. But just how good was pretty impressive. Las Vegas really only reported about 1% of the time that the reported weather wouldn’t allow pattern or maneuvers to be conducted. Now, this is great, and what I have shown in the chart is a very mathematical look at the question. But what it doesn’t show is things like seasonality of weather, comfort for training, or other quantifiable factors related to the training itself. For example, while our weather in Battle Creek is pretty tough based on percentages, much of the “bad weather” really falls during late fall and winter when we have “lake effect” clouds and snow. Southern Florida might have lots of days that the reports meet the minimum requirements for pattern or maneuvers flying, but what doesn’t show up in this math is how many afternoons “pop-up” summer thunderstorms wash out flying because they are in the area and may not necessarily be right over the reporting station. While Las Vegas has fantastic visibility, few ceilings, and not much wind, this math doesn’t tell us about how uncomfortable it might be to fly in the middle of the summer when the sun is beating down on the ramp and the air temperature is 110 degrees at 3 in the afternoon. That being said, it also doesn’t help us to think about how much -25 degrees on the ramp in Grand Forks can ruin the motivation to fly even if it is clear, sunny, and there isn’t any wind. The extremes are always interesting in comparisons like this, but so sometimes are places that don’t show up as extremes. I wasn’t surprised that Buffalo had more bad weather reports than other places, but I was a little surprised that it wasn’t worse. 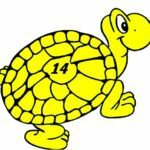 We all hear the stories of how much bad snow Buffalo gets, but from the math, I have to wonder if it isn’t less frequent than the lore would have us believe. I was surprised that Anchorage and Atlanta had almost exactly the same percentages of reports for pattern and maneuvers flying. We all think of Alaska as a wintery and remote place, but in fact, (at least in Anchorage) the weather might not really that bad for a flight training operation. Denver falls into the same category to some degree. While native Denverians (not sure if that is what they call themselves or if I just made up a word, but I’ll go with it) know that Denver has lots of sunny days, many people around the country think of Denver as a destination for winter sports with lots of snow. The reality is that those destinations are many miles west of Denver up in the mountains, that just happen to block most of that snow and leave Denver dry, sunny, and with good flying much of the time. Lots of places kind of fell into the middle of the numbers. Generally, southern states seemed to be a bit better, the Great Lakes region (Minneapolis, Chicago, Detroit, etc) all seemed to have a little more bad weather, and the middle of the country, well, fell into the middle. So what does this all mean? Well, if you are looking to travel somewhere to do your flight training, you may want to consider where the weather is going to be the least hindrance possible to making progress. There are lots of factors when considering where to get trained. Weather shouldn’t be the only one. Things like proximity to where you live, cost, and without a doubt the quality of the training at a provider will and should be major factors in your decision making process. But if all other things are equal, perhaps looking at where the weather will allow your training to be most efficiency can be the deciding factor. The data that ranked these was all based on collected METAR data over time. I suspect that while they do get some rainy periods, it is still a very small incremental period of time that the METAR reports are less than VFR type weather reports compared with other places that have more longer periods of low ceilings and visibility.